Ok, so modern marketing is very different than marketing 20 years ago. 10 years ago. Even 5 years ago. The Four P’s are celebrating a 50 year anniversary. Without an update? Advertising is no longer the epicenter of marketing. It has been replaced by the Internet for all but the biggest retail and consumer brands, or 99% of all marketing! So what are modern marketing best practices? The modern marketing mix is multi-faceted. Multi-channel. Modern marketing is the integration of traditional marketing with Internet and social media. Strategic marketing drives Outbound and Inbound marketing. Content is king and marketing is more cost efficient and measurable than ever before. 1. Do some research! Do not make expensive marketing decisions without customer insight. Know your brand (and competitors brand) awareness, perceptions, intention to buy. Seat-of-the-pants marketing will get you fired! 2. Develop a marketing plan. Ideally a strategic plan along with near-term tactical or project plans. 3. Create/build/nurture a bold, unique and differentiated brand based on customer and competitor insight. Brand and sub-brand everything. You might want to consult a branding professional because more often than not, this gets botched up! 4. If your website is more than 3 years old, make wholesale changes. If your website is over 5 years old, start over. Website search engine optimization (SEO) has changed alot in recent years, so get with the program. Again, you might want to consult a professional. 5. Make direct sales or lead-generation the priority of all marketing with lead capturing forms and registration pages, and pro-active lead research, procurement and management. Don’t skimp on this, and keep it going 24/7/365! 6. Deploy blogging and social media: Facebook, YouTube, LinkedIn, Twitter and more. Integrating the aforementioned with the mothership—website that is. 7. Make content a priority. Hire writers and journalists. Become a publisher and an editor. Repurpose content every which way. Publish or perish. 8. Leverage free publicity to the hilt. There is no excuse for not implementing PR and media relations as a key element in your marketing program. Also, please integrate PR with social media for maximum results! 9. If you can afford it, advertise. Nothing is faster and more controllable than paid advertising. Consider all options: print, internet, even hot air balloons. 10. Hire staff with modern marketing skills. 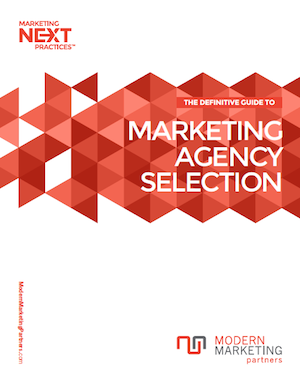 Hire agency partners with modern marketing skills (like Modern Marketing Partners). Fire low performers and promote those with modern marketing skills. What modern marketing strategies and tactics do you think are top priorities? What are your modern marketing best practices? What feedback do you have on this list? Please comment below. Certainly, please Facebook Like, Retweet, Google+ and/or bookmark. Many companies are new to the “online” aspect of modern marketing. It’s important to reiterate how IMPORTANT this is. Of all the points mentioned above, I could not stress how useful it is to have someone with excellent SEO knowledge in order to make sure all of your posted content online is very searchable. Great blog post!